This adorable black and ivory sheath dress has a great classic cut that makes it a cute work dress--and it is amped up with a fun chevron pattern. The Pop of Color Black and Ivory Belted Chevron Sheath Dress is lined above the waist. It is made of a unique fabric with a black and ivory zigzag chevron pattern throughout. 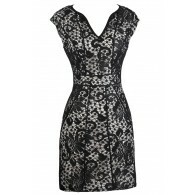 It has a rounded neckline with pintuck details and a classic sheath cut. A bright red belt wraps around the waist, tying this look together with a pop of color. A hidden back zipper completes this dress. The Pop of Color Black and Ivory Belted Chevron Sheath Dress looks perfect paired with black or red pumps or heels. Mix and match the color of the belt to create new looks. Details: Made in USA. Lined at top. Hidden back zipper. Belt included. 58% cotton, 40% polyester, 2% spandex. Lining: 100% polyester. Hand wash cold or dry clean. Small measurements: Length from top of shoulder to hemline: 34". Bust: 34". You have added Pop Of Color Black and Ivory Belted Chevron Sheath Dress into Wishlist. You have added Pop Of Color Black and Ivory Belted Chevron Sheath Dress for Stock Notification. You have set Pop Of Color Black and Ivory Belted Chevron Sheath Dress as a loved product. You have removed Pop Of Color Black and Ivory Belted Chevron Sheath Dress as a loved product.